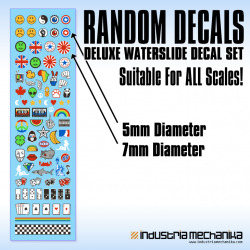 Various waterslide decal sets. These always ship free with any non-decal purchase! Decals There are 9 products. 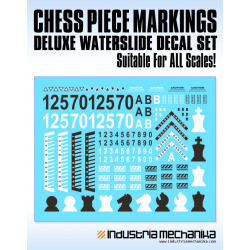 Enhance your model kits with chess game inspired decal designs. Perfect for use with our Michael Herm product line or however your imagination dictates! 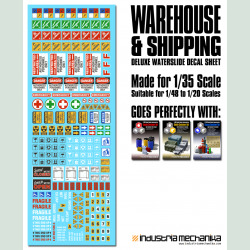 Enhance your model kits with decal designs by Ian McQue. Most of these were designed for the Remora and Waldo, but were omitted due to sheet space. Perfect for use with our Ian McQue product line or however your imagination dictates! 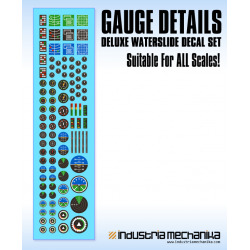 Enhance your model kit interiors with our gauges and screens waterslide decal set. 3mm, 4mm, 6mm and 10mm round gauges along with a variety of rectangular screens and button sets. These extra decals from The Hopper model kit can be used kits associated with your Hopper or whatever your imagination desires! We had several requests for the decal sheet for the T-Zero to be offered separately so we made extras. 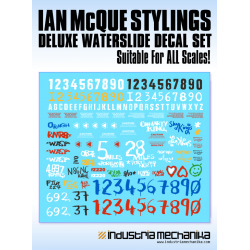 Sheet contains waterslide decals and markings for use on whatever your imagination desires! 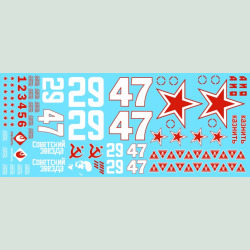 We had several requests for the decal sheet for the Red Star 47 to be offered separately so we made extras. 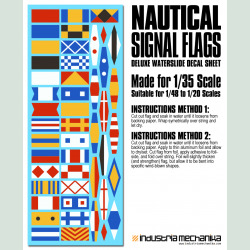 Sheet contains waterslide decals and markings for use on whatever your imagination desires!